This copy of Kitty Paw was provided to me for the purposes of this review, but the opinions here are my own. 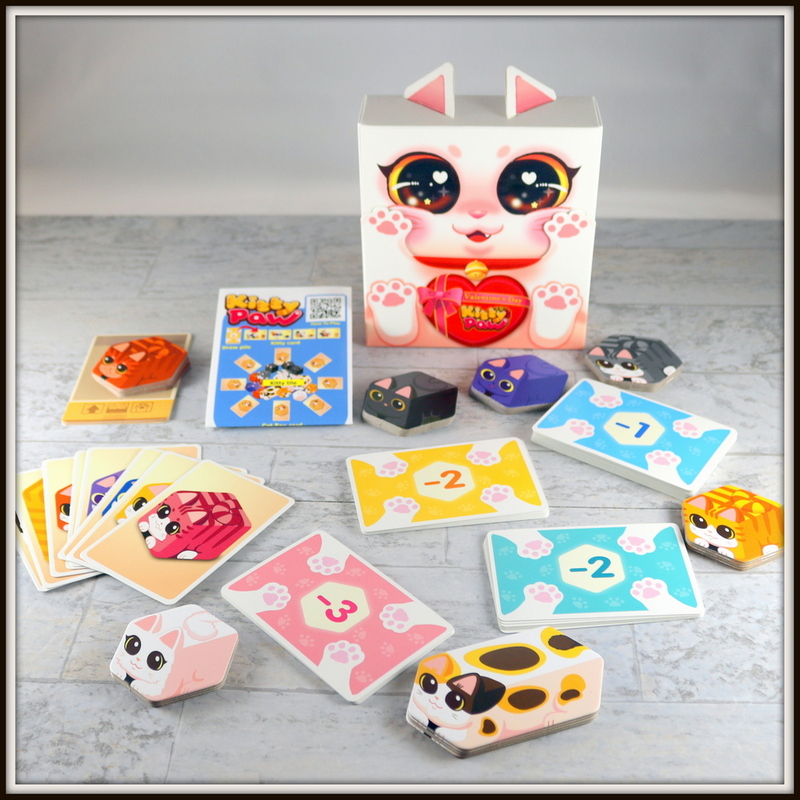 Clearly meant for the cat lovers in your life, there's a new sweet box for the quick-thinking, pattern-matching game Kitty Paw from Taiwanese artist and designer Aza Chen. 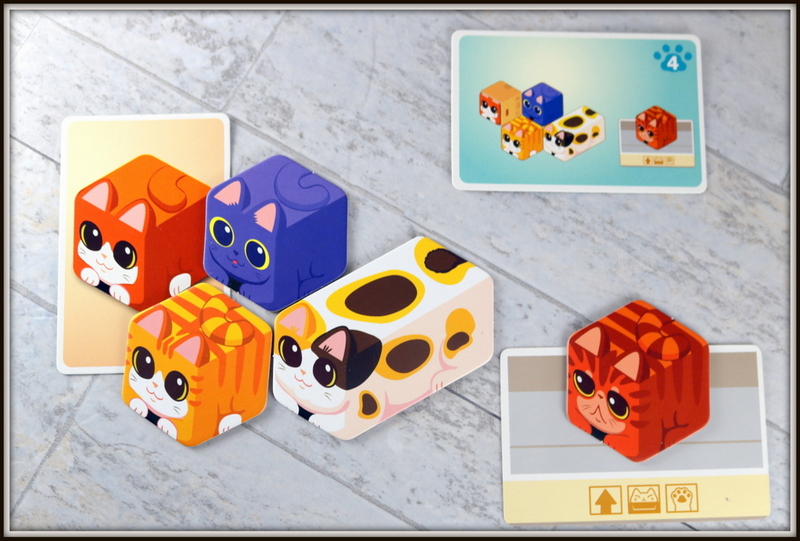 Adorable kittens and a box with ears draw you in to the simultaneous-action game where players scramble to be the first to match a particular configuration of kittens on a card. Be the first to finish, and win your card and the points on top. 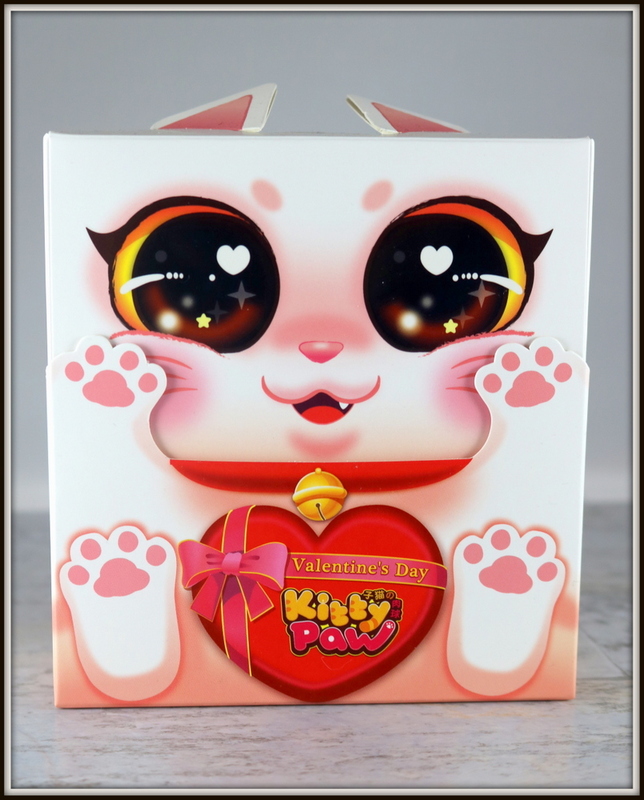 Kitty Paw Valentine's Day Edition comes in a small white box sweet cat eyes and little white ears - this one also holds a special Valentine's Day message inside. 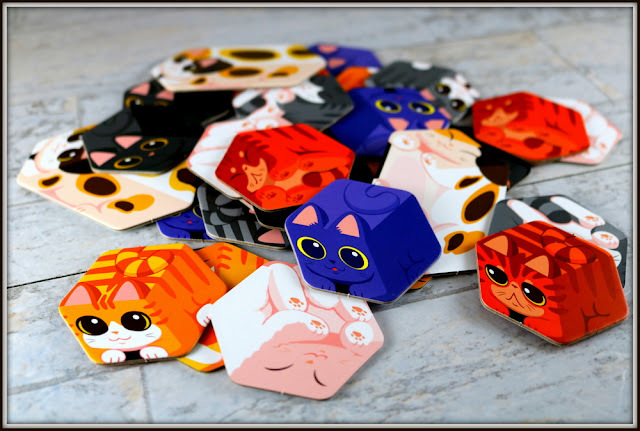 The Kitty tiles are brightly-illustrated hexes that are drawn to look like cubical cats from various angles--front and back are different. The Cat Box cards each have a different cat (or surprise dog!) on the back. 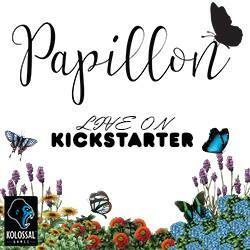 The Box cards are made to look like empty boxes in vertical and horizontal configurations. 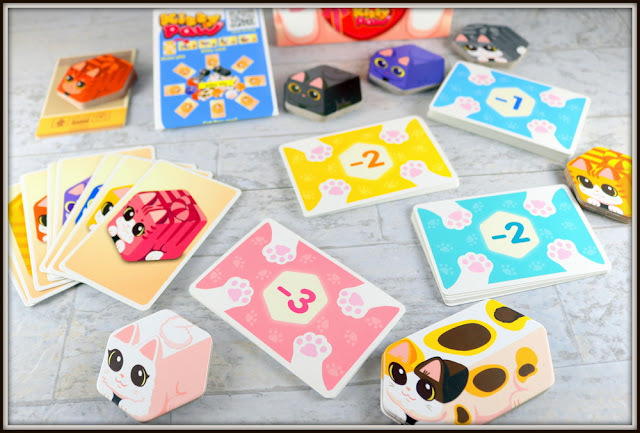 The 48 Kitty cards are the cards that show the Kitty tiles in a particular arrangement; they come in three levels, and there are two sets of level 2 cards, to add to replayability. 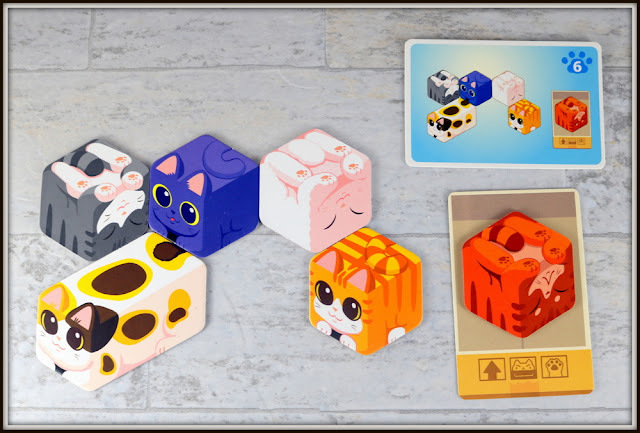 To get ready to play, you need to put one of each type of Kitty tile in the center of the table for each person playing (two of each for 2 players, three of each for 3 players, etc.). Then, spread all eight of the Cat Box cards around the pile of tiles, box side up. 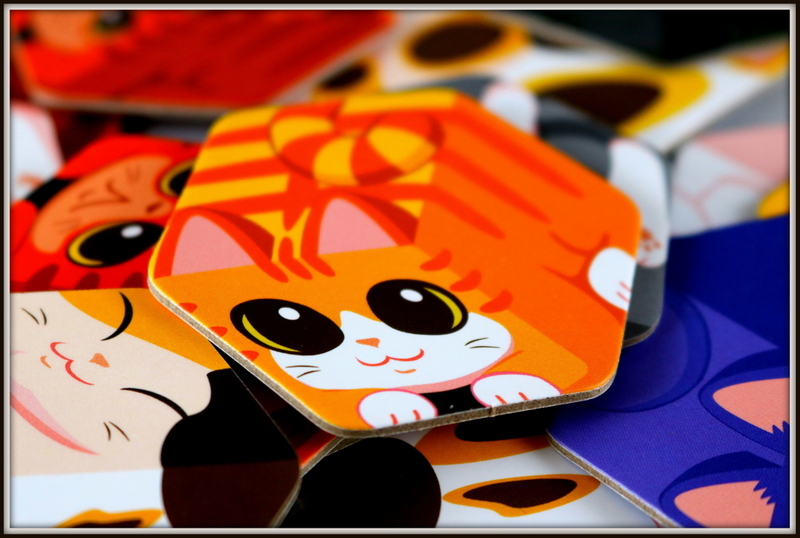 Prepare a tableau of Kitty cards by dealing four out, face up, next to the deck. You're ready to pounce! One, two, three... Kitty Paw! Everyone reaches for the Kitty Card they'd like to work on, often grabbing one that someone else was eyeing in a flurry of flying paws. 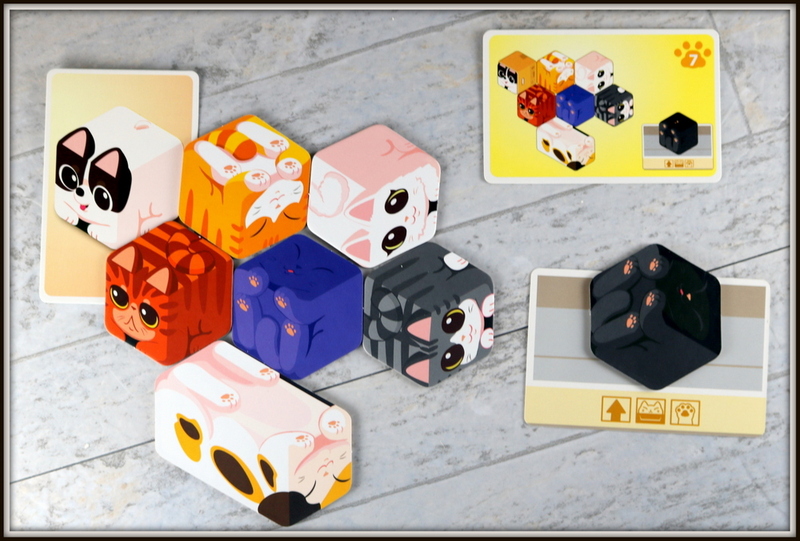 All players will work simultaneously to take Kitty Tiles from the center (one at a time!) 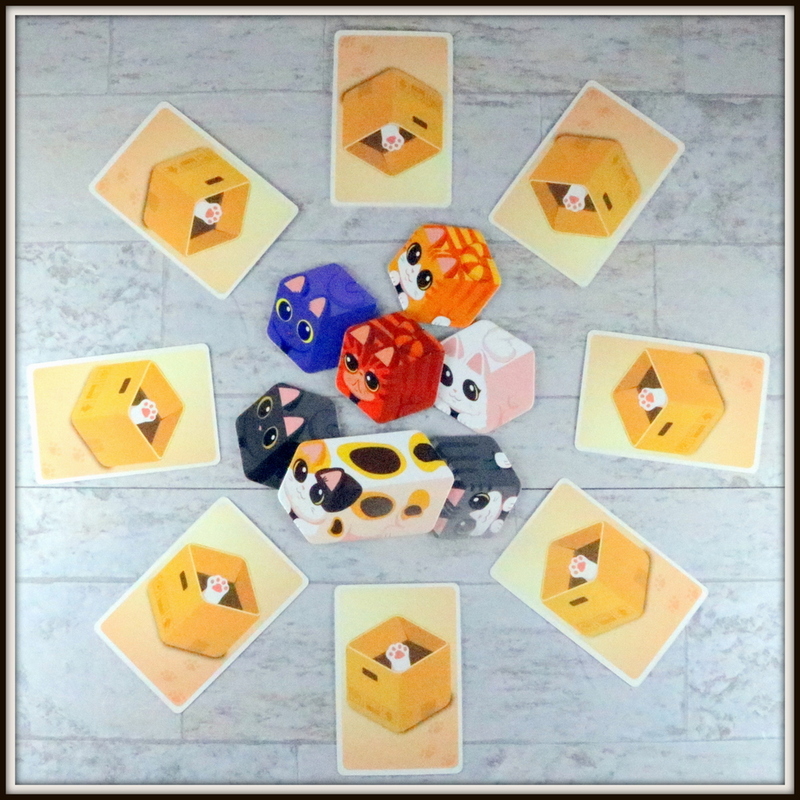 to arrange them into the exact image show on their Kitty Card. 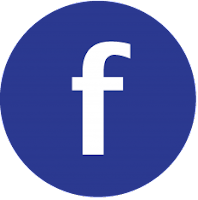 This means you have to pay attention to whether a particular cat is face-up or face-down, and which way it is facing. A little practice makes flipping these kittens into the right positions easier, as you get used to the way each side of the tile looks. 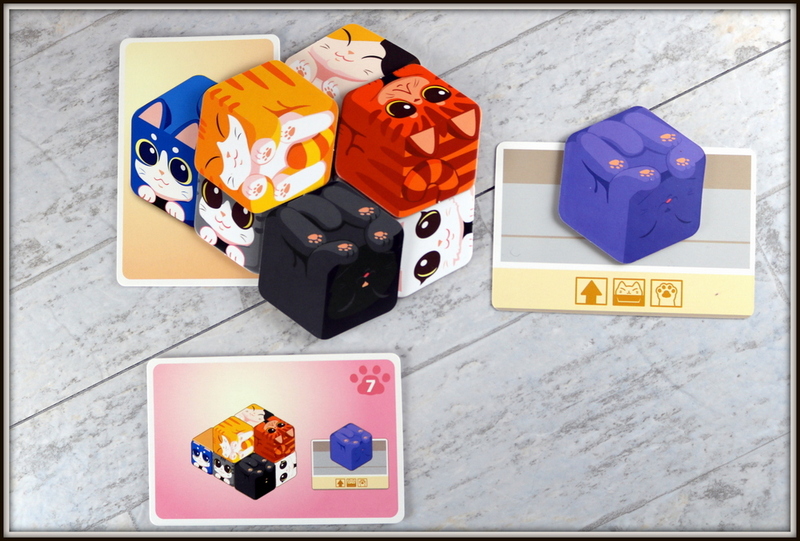 Most Kitty cards will also have a Kitty tile shown on a Box card, so make sure you get the right kitty there, too. When you think you have matched your Kitty card exactly, call out, "Kitty Paw!" and strike the Lucky Cat pose. 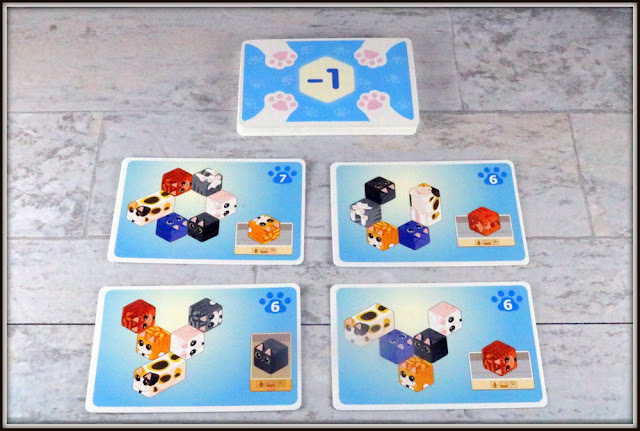 The last player to match you in the Kitty Pose has to flip over their card and take the -1, -2, or -3 point penalty on the back! Now the other players check your work. If you were right, you earn your Kitty card and the points shown on it. If you made a mistake, you'll have to flip it over for the negative points instead. Clear the current Kitty cards and start a new round. Keep flipping, arranging, matching, and pawing until you've gone through the deck of Kitty cards, or one player has claimed five Kitty cards total. Count up the points on your stack, subtracting any penalty points, and the player with the highest total wins! 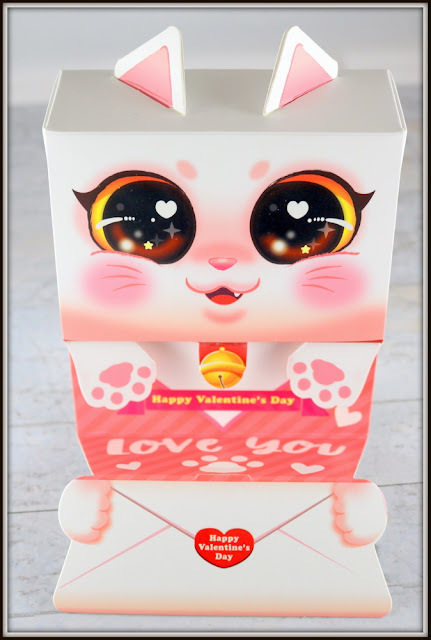 As far as I can tell, the cards and parts are the same in the previous edition of Kitty Paw as they are in the new Valentine's Day Edition, so choose the box that's right for you. My daughter is already considering getting a second copy of the Valentine's Day Edition to give to a friend for Valentine's Day! It's cute! 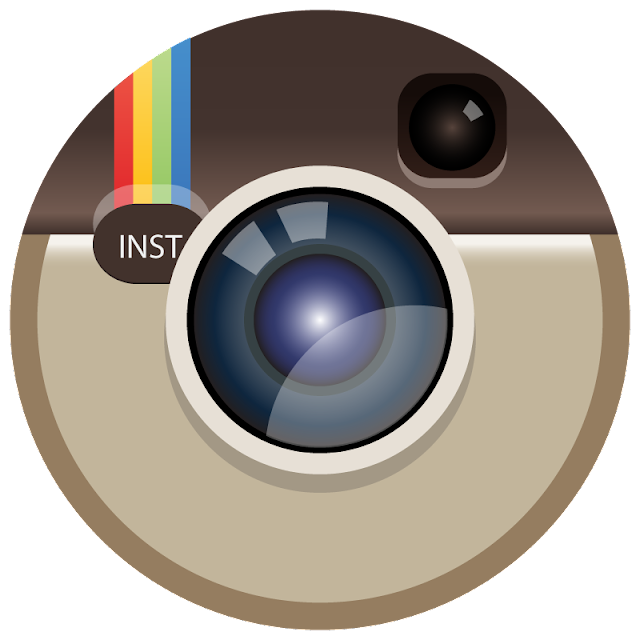 Do you squee over large-eyed, fuzzy animals? 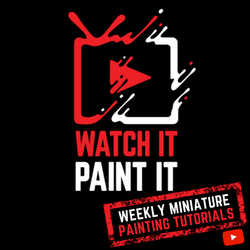 You'll definitely be drawn in by the artwork and theme. 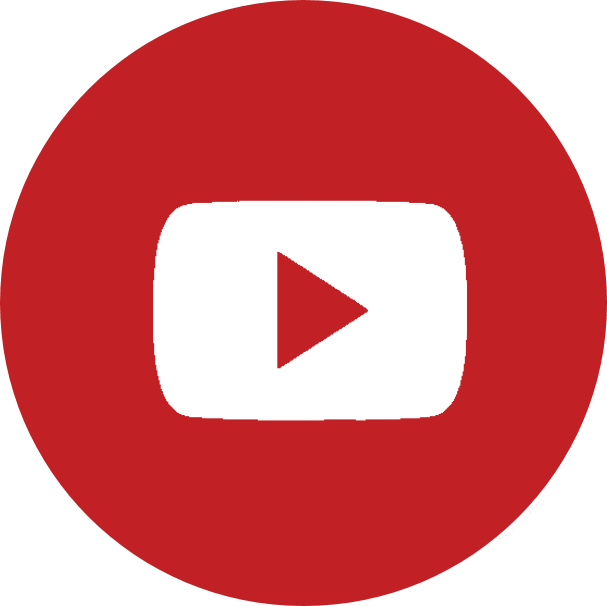 It's fast, with a full game normally running about 15 minutes for two players up to 25-30 minutes for four very competitive players. 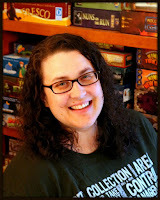 It's engaging--repeated plays help you become more familiar with the tiles and the cards, and keep you coming back for more. 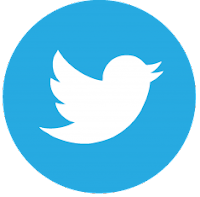 The translated rules could use a little extra polish, in my opinion, because they feel a little stilted and sometimes struggle to get the point across, but two passes through reading the instructions made everything clear enough to me. I worry a little about the long-term stability of the box. 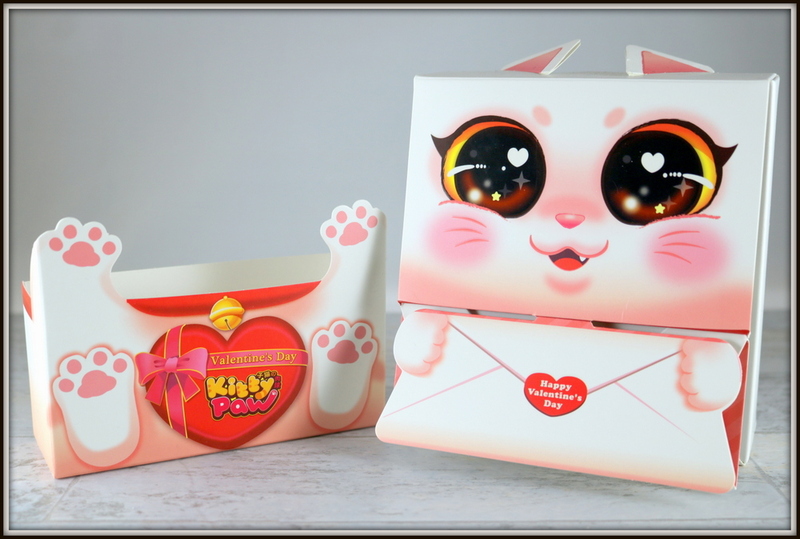 The fold-out Valentine part slides into a smaller sleeve to hold everything together and keep the box shut... but I know that the box-as-kitty is a big part of the shelf presence and draws people to look at the game, so I probably wouldn't change it. Kitties. Very clearly, this is a game for people who love cats. 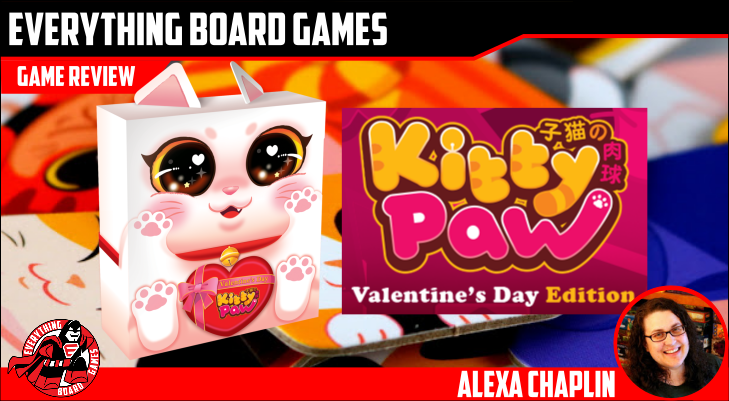 Players who like speedy reaction games like Dutch Blitz or Slap It!, or who like pattern-matching games like On the Dot or Tangrams, will probably like Kitty Paw too. 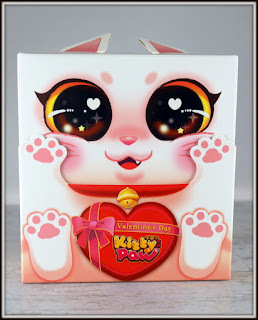 The adorable art and quick-thinking pattern-matching made Kitty Paw Valentine's Day Edition a hit as a filler or after-dinner game for my family, and is a game that my daughter loves to share with her friends. She's claimed ownership of this one, and it has a happy spot on her personal game shelf.